ITS TIME TO CELEBRATE: MANUFACTURING DAY/MONTH IS HERE! October is right around the corner and it’s time to celebrate! You can find Florida “Manufacts” on the FloridaMakes website to add to your own local manufacturing info facts. Here are some of the statewide facts you can find under FLORIDA MANUFACTS. In April 2018, manufacturing had 375,500 jobs in Florida, an increase of 12,300 jobs over the year. Manufacturing has gained jobs for 88 consecutive months, after losing jobs over the year for more than four years. In addition to statewide data, you can find downloadable in-depth regional reports on that same MANUFACTS webpage. For example, the report for West Central Gulf Coast is 28 pages, was compiled by IHS and looks like the image to the left. In addition to West Central Gulf Coast, reports available for you to find include regional reports for Central Florida, the First Coast, Gainesville Area, Mid-Florida, Northwest Florida and Capital Region, South Florida, Southwest Region, and Volusia County. 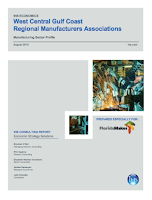 Check out the report for your region to gather local details to support your Manufacturing Day events. More Florida Manufacturing facts can be found on FLATE’s website with the Engineering Technology Degree pages. 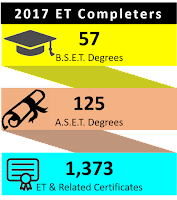 Each year, FLATE partners with the Florida Department of Education to obtain completion and enrollment data for the A.S. Engineering Technology degree, its college credit certificates and all other related degree programs. For FLATE, related programs are those academic programs that also support manufacturing. The annual report is a 5-year summary with break out data by college and program. 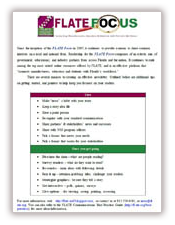 In addition to state and community college data, FLATE also reports on related high school and post-secondary programs. These programs provide articulated pathways into college programs and dual enrollment with the A.S.E.T. The Florida Advanced Manufacturing high school program has shown significant growth in the past several years. Here are a few FACTS captured from this report. We do not expect the 2018 data from the Department of Education until later this fall, so the most current report covers the 5-year period, 2012-2017. Below are a couple snapshots of ET enrollment and completed data. A summary of MFG DAY-FL student tour data for the past 5 years is posted on the MFGDAY-fl.com site (scroll down to bottom). 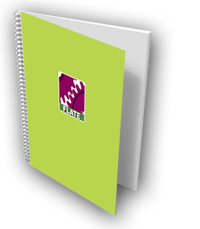 Links to student, hosts and chaperone surveys, lesson plans, graphics, tour tips for the industry hosts are all available from this page. 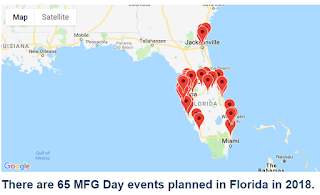 To date, we have 49 events posted on MFGDAY.com for Florida. I know that there are many more, so please get your events posted as soon as possible.